Is it me or are bulk bins NOT the way to go if you have allergies? I typically buy quite a few items in bulk, including rice, lentils, quinoa, and oats, but I had recently felt as though I was reacting to oats. Horror of horrors! I cut them out of my diet for a week or so and felt better, but I couldn’t imagine continuing on without them. After reading about cross-contamination within bulk bins, I decided to give some other packaged brands of oats a try…. I picked up these Country Choice Organic Oats and found that they agreed with me much better! After using them for a while, I was actually contacted by the company to receive a few samples of their product, so I wanted to be sure to mention them here, as I do feel they are a superior product. With my newly discovered almond allergy, I have to be extremely careful of coming in contact with anything that might contain any trace of them. Buying in bulk becomes problematic when scoopers and bins are intermingled. For example, if the scooper from the oats is used to also scoop out almonds, I may feel as though I’m reacting to oats, when in reality the almond residue is bothering me. 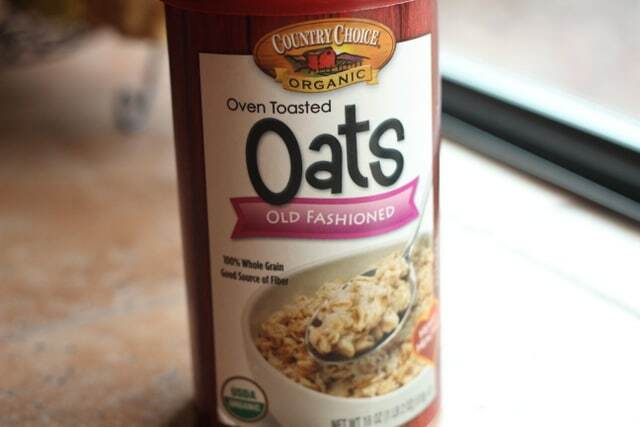 Country Choice oats play a huge part in today’s recipe, which is low in added sweeteners and has NO added oil. 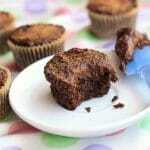 This is a great recipe for kids, as it has many flavors that they enjoy, such as applesauce, peanut butter, and chocolate. My girls just love these! 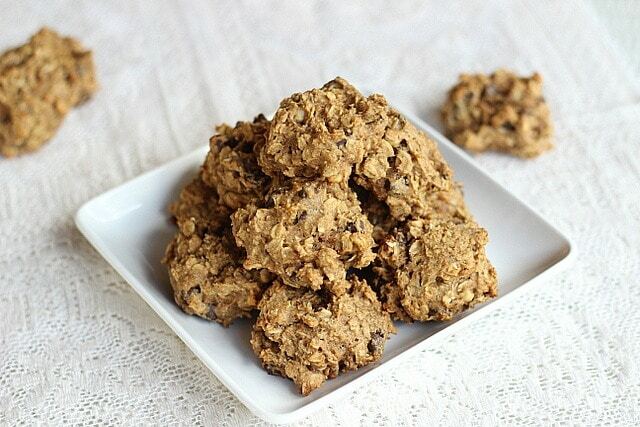 Only one bowl needed to make these deliciious, low sugar cookies! Mix everything together in one bowl until well combined. 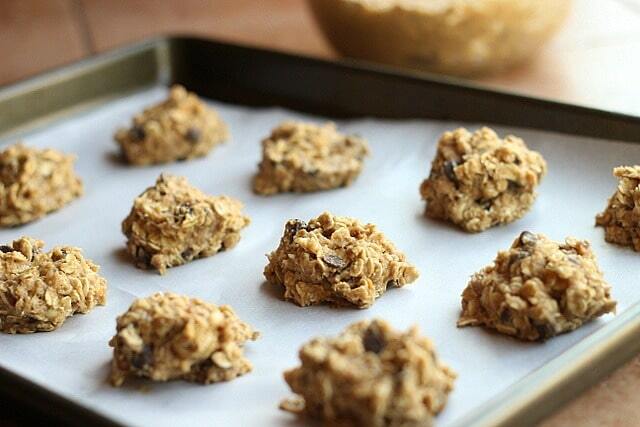 Spoon tablespoons of dough onto a parchment paper-lined cookie sheet. I cannot stop eating these, and I challenge you to try! 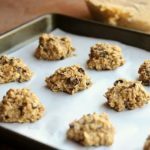 Not only are they super easy to make, they are soft, perfectly sweet, and unabashedly healthy…and did you catch the nutrition stats on them? 98 calories, low in sugar, and almost low carb (anything under 10 g is considered low carb). 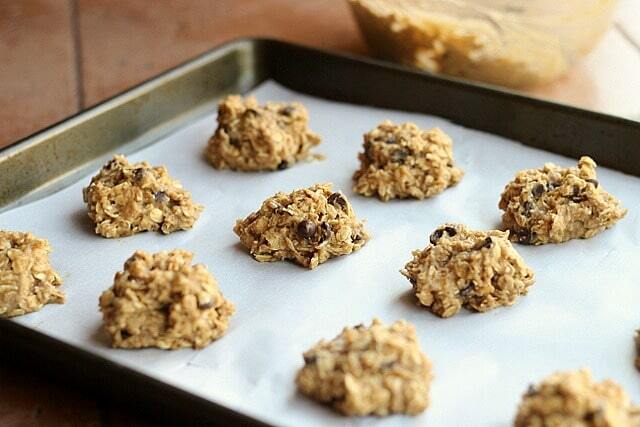 No butter or oil, no eggs, no refined sugar, and very little flour…I can’t think of a healthier way to enjoy a cookie! Have you ever had trouble buying items from bulk bins? **Updated note: In light of Shirley’s comment below I just wanted to add that I am well aware that Country Choice oats are not certified to be gluten-free, so for those of you with gluten sensitivity, be aware. I personally do not have an allergy to gluten, so I made no mention of it either way. 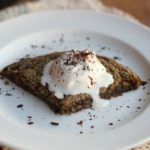 You can use whatever oats you’d like in this recipe. Happy baking! Thanks for the great recipe. I can’t wait to try it out. Not sure why Shirley & Co vented like that. Nowhere did you say those oats were gluten-free. Thanks for handling that so gracefully. And thanks for taking care of my sweet tooth with an oil-free recipe that marries two of my favorite flavors–peanut butter and chocolate. Thanks Monica! I hope you enjoy these if you try them! I’m so glad you posted this, and commented about it. I didn’t know about possible cross-contamination with bulk bins, though it makes sense. Your recipe looks delicious, and definitely one we are going to try. Your little one is SO cute! Oh, Arik would absolutely love these!! The same thing happens to me with bulk oats at Whole Foods! I have a major soy allergy and I think it gets me sometimes. 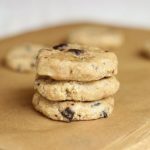 These cookies look and sound amazing and oh, how I would love them, but they may not be oil-free (and I am on an oil-free program). As you probably know, most peanut butters have vegetable oils added to them…. so sadly, I cannot enjoy your lovely recipe. I never use peanut butter with added oil, so perhaps you could seek out one of those? Laura Scudder’s makes a great peanut butter, and it is sold at most regular grocery stores. I’ve been re-thinking the bulk bins too because of gluten contamination. I typically buy rice and dried beans and always rinse them well, but that’s probably not enough (especially if other grains get mixed in!). 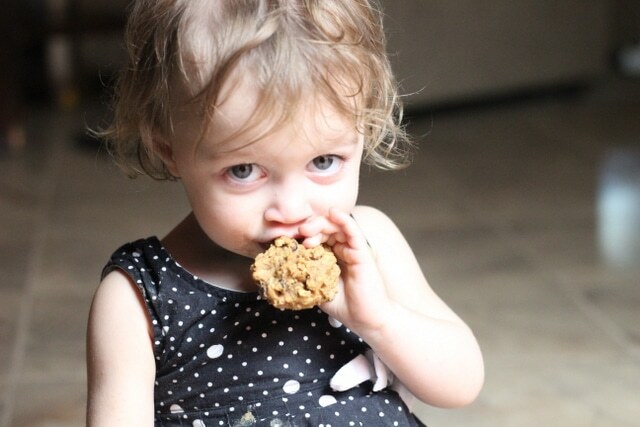 Lauren, while those cookies look great and your daughter is adorable, I have to be a party pooper and point out that Country Choice Oats are NOT safe for anyone on a gluten-free diet. It’s more than about cross contamination in the bins in stores. With oats, it’s cross contamination with gluten-full plants in the field, on harvesting equipment, on processing equipment, etc. One must use certified gluten-free oats that are grown in dedicated fields and are processed on dedicated equipment from the fields to the final processing and packaging. Country Choice Oats were one of the brands that was tested back in the landmark study by Tricia Thompson and others. (Here’s a summary: http://www.glutenfreedietitian.com/newsletter/gluten-free-oats/ and here is the complete info when published in New England Journal of Medicine with specific results in the table graphic: http://www.nejm.org/doi/full/10.1056/NEJM200411043511924) They tested from less than3 ppm (a safe level) to up to 220 ppm gluten! Less than 20 ppm gluten is the newly approved standard and some folks (including me) react to far less than that. Country Choice Oats says the following on their site: “ARE YOUR PRODUCTS WHEAT-FREE? Some of our products do not contain wheat. However, all of our products are processed on shared equipment that uses wheat. Please read the ingredient list carefully before purchasing. ARE YOUR PRODUCTS GLUTEN FREE? Our oats are not considered to be gluten free due to the possibility of cross contamination with wheat or similar grains.” We all know that if products are processed on the same equipment that they are not safe, but with oats, it’s far more than that. 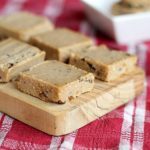 This recipe will only be gluten free as labeled if made with certified gluten-free oats, of which there are several brands now, but Country Choice Oats is definitely not one of them. Sorry to be so adamant, but I don’t want gluten-free folks who don’t know about the issues with oats to get ill/do damage to their bodies.